You’ve already been told that good descriptive text which fully answers search queries will help your page do well in search engines. It’s well-known that being thorough and complete in descriptions gets more search traffic. But the sales team pushes back when SEO takes that crisp, clean page with the bold call-to-action and turns it into a wordy text-filled page, full of internal links that may take visitors away from the “Join” or “Buy” buttons. Here’s another option: Accordion Text which expands to show more. When There's More to Say... Just Say It! Imagine your typical product sales page with bulleted features at 30 to 50 words long at best. You know that some customers will want to have more detail before purchasing, but this punchy "Call-to-Action" page is not the place to have a long wordy description. So collapse each bullet of the product description into an accordion so that those who want to read, can read, and those that want to jump right to the "Buy Now" button can do so. There are multiple options here to make the text fill less space on the page an to make it less prominent. One option is rotating carousels with text below several attractive images. You can include 60 words of text below each of 5 images in that carousel and you've added a total of 300 words of descriptive text to your page. Just be certain to make that carousel a search friendly version (check with your front-end developer or check the text-only cached view in Google search results). 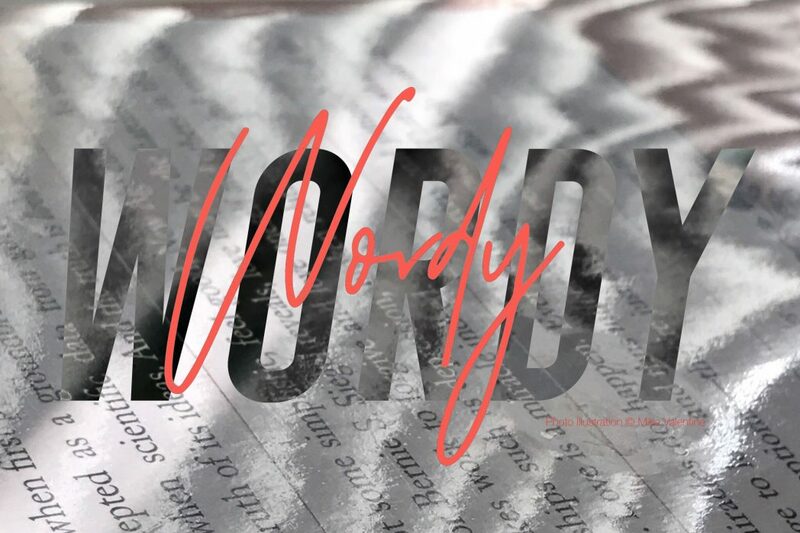 There is always that extra keyword focused text that you want search engines to index, but don't want filling up a visually dull gray text-filled page. Designers want to keep the page clean, with beautiful images surrounded by lots of white space - but search engines need context and relevance of text in order to rank your page well against your competitors. Tell search engines what is in that beautiful picture - how it works or describe fully and completely what it represents. SEO benefits of linking are well-known: more links pointing to your page help it to rank better. But less well-known is the value of links for relevance and context. What you link to helps to define it's relevance and adds context, whether you link out or link internally. Sales pushes back on links of any kind because it takes the visitor away from the current call-to-action. 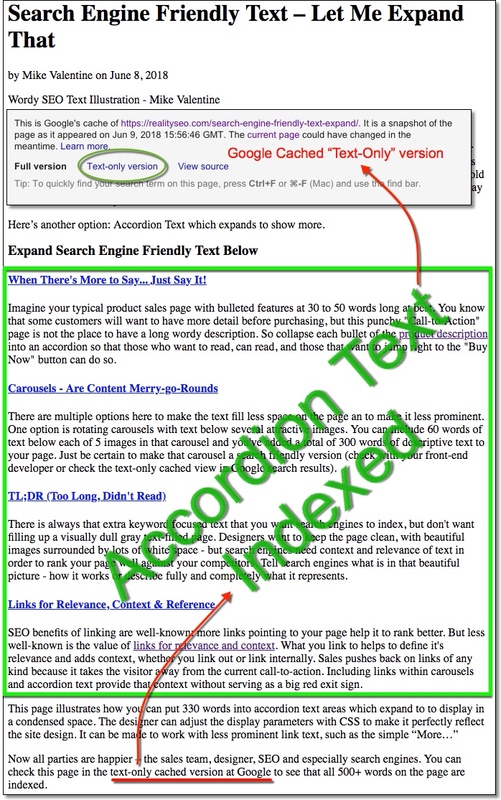 Including links within carousels and accordion text provide that context without serving as a big red exit sign. Now all parties are happier – the sales team, designer, SEO and especially search engines. 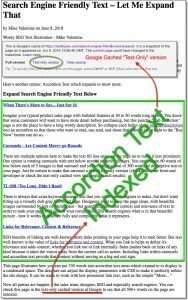 You can check this page in the text-only cached version at Google to see that all 500+ words on the page are indexed.